A desktop magazine holder is meant for condensing brochures & pamphlets together, to give clients a one-stop location for an assortment of marketing materials. The literature storage rack, desktop magazine holder gives you the ability to showcase your magazines upright & elevated, instead of stacked on a counter. Not only will this give clients a better view of your displayed magazines, but it will also help keep them arranged & looking great. 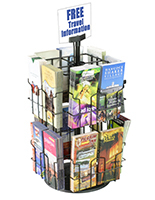 A desktop magazine holder, also known as brochure holders, can be used in numerous locations to present reading materials & informational pamphlets in an eye-catching manner. The desktop magazine holder can be used in retail stores, trade show exhibits, hotel lobbies, bank foyers & even within office reception areas. A desktop magazine holder is available in a few different styles & designs to suit any presentational needs or preferences. The brochure rack, desktop magazine holder is available in both wire & metal designs, both of which are sold in different sizes. 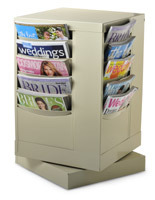 We sell this desktop magazine holder as a metal literature rack, showcasing your magazines in tiered pockets. While the metal storage displays only display the top portion of a magazine, their spinning design makes it possible for clients to browse through an entire selection, without having to remove literature from the rack. The desktop magazine holder, such as countertop brochure holders, is also available as wire fixtures, showcasing a full frontal view of your literature. These magazine files also rotate! Displays2Go is home to hundreds of different brochure displays with multiple literature pockets, magazine files & literature displaying products to help businesses create effective marketing campaigns that are both beautiful & effective at distributing pamphlets. In addition to our broad selection of spinning and revolving countertop literature displays, we also offer numerous wall mounted magazine files as well as those meant for floor-standing presentations. Please feel free to browse through our entire selection or to check out some of our other 5,000+ products, found on our main shopping page. Thank you for shopping with us at Displays2go!